We bring people to the table with what they bring to the table. Rep Radio is "On The Air"! We support, promote, engage and inspire the arts community by igniting the ghost light that shines on the stages of the up and coming, the unsung heroes, the brilliant writers and the dynamic designers. BSR has sought to promote the exchange of viewpoints rather than any particular point of view. To that end, we welcome commentary from professionals and amateurs alike about the performing and visual arts, as well as any other field of interest to our eclectic group of contributors. Powered by Rep Radio. So, tell us what you think. It is our goal to generally shine a light on the Greater Philadelphia creative community with a focus on performing arts. On occasion, our light is fortunate to shine beyond the region to connect with New York City, Los Angeles and Edinburgh! More traveling to come. Where should we go next? Earlier this season, we launched our new t-shirts on a platform that gave us a limited time to purchase. Now, we are permanently placed and you can buy as many as you want! So, what are you waiting for…SHOP THE LOOK!! Over the years, many have contributed to our body of work. See who lends their voice to us now. With 25 years of arts experience both front and back of house, Darnelle has assumed the role of Actor, Stage Manager, Playwright, Director, Producer, House Manager, Box Office Manager, Teaching Artist, Marketing Director, Barrymore Voter and Producing Artistic Director. He wrote his first play, “Sidewalk Cafe” in 1999. He later moved to Philadelphia where in 2005, founded Represented Theatre Company and began planning for Rep Radio, which launched in 2009. 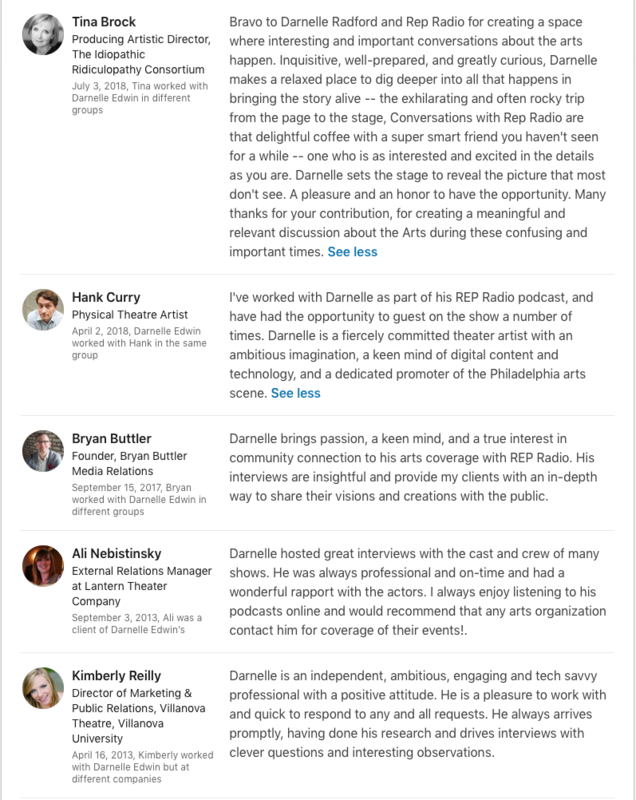 Well-rounded in Arts and Culture, Darnelle has worked for The Franklin Institute, Philadelphia Museum of Art, Historic Philadelphia, Inc., Keen Company, and The College of Physicians of Philadelphia. He studied Arts Administration at NYU where he co-founded Just Learn Something, which currently promotes “The Business of Broadway” written by Mitch Weiss and Perri Gaffney. He currently serves on the Board of Directors of American Historical Theatre.